Summary: The latest Financial Stability Report by the Fed provides insight into borrowing by businesses. Some facts you may want to know. In case you missed it, Fed research finds the percentage of debt Americans owe by major category is: 68% mortgage, 11% student, 9% auto, 6% credit cards, 3% home equity revolving and 3% other. Speaking of debt, community bankers will find the most recent Financial Stability Report by the Fed interesting perhaps. At least, as it relates to one chapter on borrowing by businesses. The analysis finds business sector debt relative to gross domestic product (GDP) is at historically high levels and there are signs of deteriorating credit standards. Since community bankers do so much business with small businesses, this is worth a deeper look. We note that the wide-ranging report covers a number of topics deemed important to the nation's financial stability. It was crafted by the Fed as a way to highlight issues worthy of attention for their potential to impact the nation's financial stability. Several of the findings are especially noteworthy for community banks. While borrowing levels for households have risen in line with rising incomes and are deemed to be at a low to moderate level currently, business debt has been racing ahead. Even worse, the report notes that "debt has been growing fastest at firms with weaker earnings and higher leverage." 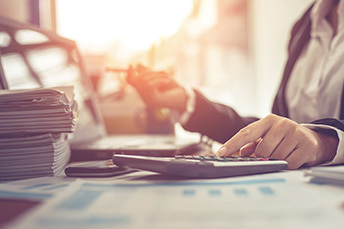 That means community bankers will need to make sure to stay diligent and closely monitor business customer loans and cash flows for any potential sign of softness. No matter how you are positioned currently, note that existing business customers may be getting overextended because they are also using riskier borrowing elsewhere. Leverage can be spooky when it gets too high too fast, and online lenders abound, so more common community bank lending activities must be continually monitored. The report notes that the ratio of debt to assets (leverage) for all publicly-traded, non-financial firms is near its highest level in 20Ys. That level has stayed pretty much the same since 2016, so bankers should be on alert. In prior years, low interest rates have kept debt service costs fairly affordable for businesses. Now though, as rates rise, businesses could start feeling the pinch of higher debt costs. This could be a bigger issue than expected for small business loans that have rising adjustable rates. The one bright spot for banks is that, while overall business debt is at historically high levels, growth of debt slowed in the first half of 2018. Meanwhile, other early warning signs contained in the report come at a time when community banks are seeing some regulatory relief, but that too may not last. For community banks, the bottom line is that there are some warning signs about potential problems with business loans, so the need for thorough risk monitoring is vital. Be especially prudent and diligent with your lending practices. Doing so will help ensure that you will be on solid footing, even when the time comes for a shift in credit quality. Almost 67% of millennials are saving, 54% are budgeting and 57% have savings goals. Nearly 50% of millennials have $15k or more in savings. The top savings goals are: emergency fund (64%); retirement (49%); buying a home (33%). According to the latest forecast of the ABA Economic Advisory Committee (EAC), economic growth will lessen yet continue through 2020 due to full employment and increasing wage growth. These will both support healthy consumer spending and moderate business investment. Growth in 2019 is projected at 2.1% and for 2020, it is 1.7%. The World Economic Forum published its 2019 Global Risks Report. The top risks in terms of likelihood identified were: extreme weather; failure of climate change mitigation/adaption; natural disasters; data fraud and theft; and cyberattacks. The top 5 in terms of impact were: weapons of mass destruction; failure of climate change mitigation/adaption; extreme weather; water crises; natural disasters. Banks should consider working these into their business continuity plans.